Neurofibroma is a benign peripheral nerve sheath tumor that may be sporadic (majority of cases) or associatied with Neurofibromatosis 1 (NF1). In the absence of NF1, they occur as a sporadic, solitary, superficial tumors located in the dermis or subcutis. Grossly, they cause fusiform expansion of the nerve when involving large nerve trunks. They are glistening, yellow-white in appearance with a soft consistency. Unlike schwannomas, secondary degenerative changes are uncommon. 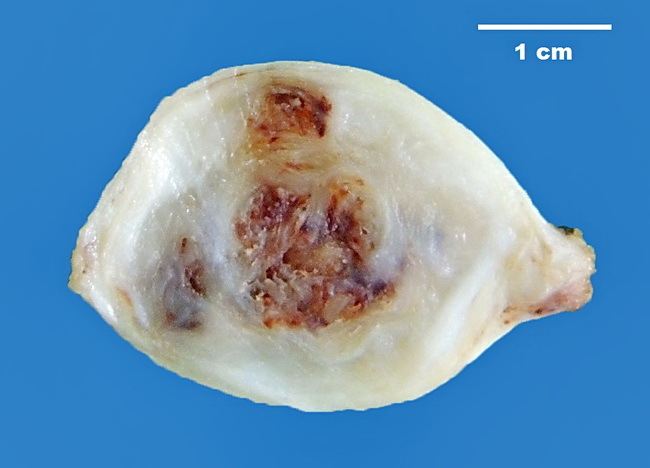 This specimen was removed from a 29 y/o male who presented with a slowly-growing soft tissue mass in his right calf. The lesion was well-circumscribed and showed a tortuous nerve twig on its external surface. Cut surface is greyish white with foci of hemorrhage. Microscopic examination revealed a neurofibroma. Case courtesy of: Dr. Sanjay D. Deshmukh, Professor of Pathology, Smt. Kashibai Navale Medical College, Pune, India.